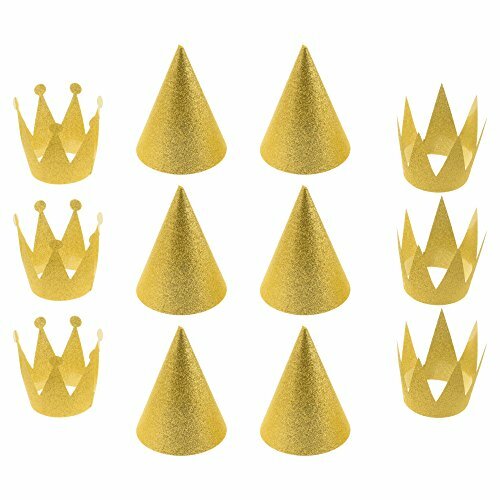 Perfect party supplies: gold crowns hats are suitable for various birthday parties, wedding party, baby shower, theme party. Golden cone crown hat with bright colors to enrich your parties. Each Size (installed): The cone hats is about 3.5" x 3.5" x 4.75". The crown hat is about 2.5" x 2.5" x 3". Each party hat has an elastic string for holding the hat in place and prevent unwanted fall. Each package including 6 pcs cone hat, 3 pcs prince crown hats and 3 pcs princess crown hats.